Noise level is as low as 62dBA at 23 feet when idling. This is substantially less noise than competitors’ machines. Direct-injection engine meets strict new EPA Tier4F emission standards (PDS185S-6E1). 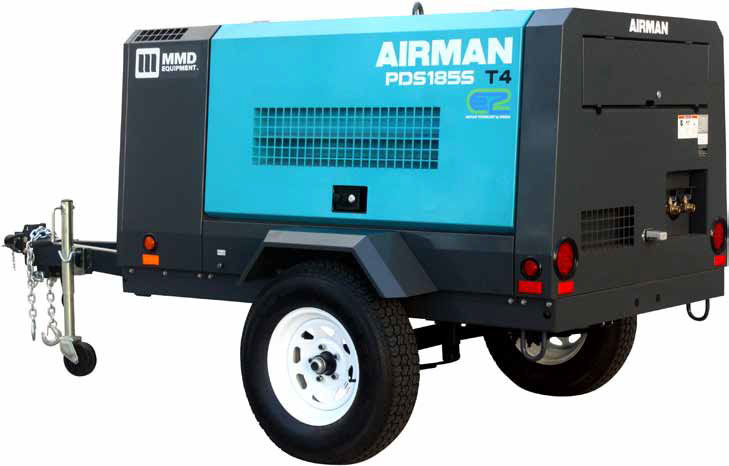 The PDS185S-6E1 offers the best fuel economy: for any air compressor in its class. Automatic engine idle drops speed to 1300 rpm when there is no load on the engine. Fuel economy is maximized by “throttling” or restricting the air intake, depending on demand. Large, lockable gull-wing style doors with gas struts virtually lift themselves for easy one-hand access to tool storage and service components. Larger tool compartments hold 90 pound breakers and other tools and hoses. Powder-coated finish and stainless steel hardware maintain their attractive appearance. Engine is directly coupled to the airend by a fiber gear coupler for improved power transmission, alignment and longevity. Improved unloader valve and air pressure regulator feature O-rings instead of diaphragms. Air Receiver Tank Capacity: 5.29 gal. Lubrication System Capacity: 3.96 gal. Cooling System Capacity:- 1.93 gal. Weight with Towing Frame:- 2420 lb. Weight w/o Towing Frame:- 2120 lb. Length with Towing Frame:- 132 in. Length w/o Towing Frame:- 76 in. Width with Towing Frame:- 68 in. Width w/o Towing Frame:- 49 in. Height with Towing Frame:- 62 in. Height w/o Towing Frame:- 45 in.